The subject of antennas is arcane and boring to the crowd. But to anyone trying to talk (or type) to the world from a small plot in crowded England, they’re an interesting headache. This is what got me into the subject. The issue of directional antennas (e.g., Yagi) is left aside, as it’s something of a separate problem. Where a (sometimes more logically called ‘r’) is the radius of the smallest sphere enclosing the entire system, and the free space wave number k = 2π/λ. This rule is derived from near-field charge storage around an antenna, and refers to an ideal mathematical situation. Estimating the efficiency factor η is an additional but important problem. A short dipole has low radiation resistance and is highly reactive. This makes it hard to match to a transmitter or receiver, and even when matched the bandwidth is small. Over recent decades computer simulation allowed small designs to be optimised, as shown in this paper. There were hopes a few years ago metamaterial would provide a solution, but it's just alternative matching system at HF. Most solutions designed by academics are mechanically complex and impractical for longer wavelengths. The last three comprise the next sections on this page. Originating with research on metamaterials is a technique called stub matching. To transmit a signal its necessary to match efficiently to a 50 ohm transmitter. Arranging a shaped conductor in the near field of a shortened dipole gives a very effective matching system. The near fields of the dipole are “loaded” by the secondary element. 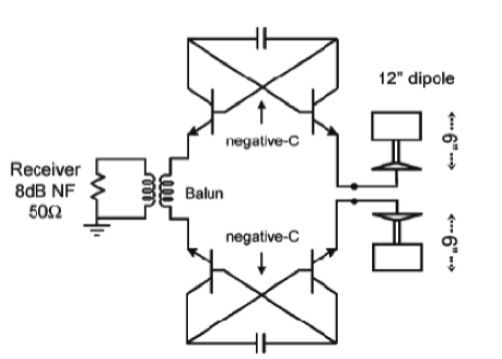 Putting additional elements in the near-field of a dipole can affect radiation resistance. With a Yagi it’s reduced. It’s also possible to increase radiation resistance. Because a short antenna has low radiation resistance, the parasitic elements must be used to increase it to match a 50 ohm feed line. There is no metamaterial involved in this. Metamaterial is where hundreds of cells create negative refractive index. Its useful when applied to microwave components, but at HF the resonant structures are impractically large. It’s nothing more than a new loading method. HF antennas are a whole different game to the UHF and SHF devices shown in theoretical papers. Viewed from the perspective of ham radio, a lot of academic hot-air has been published on this subject. The resulting antenna is high-Q, narrow bandwidth as predicted by the Chu limit. Nearby objects (such as the ground) make it difficult to tune up. 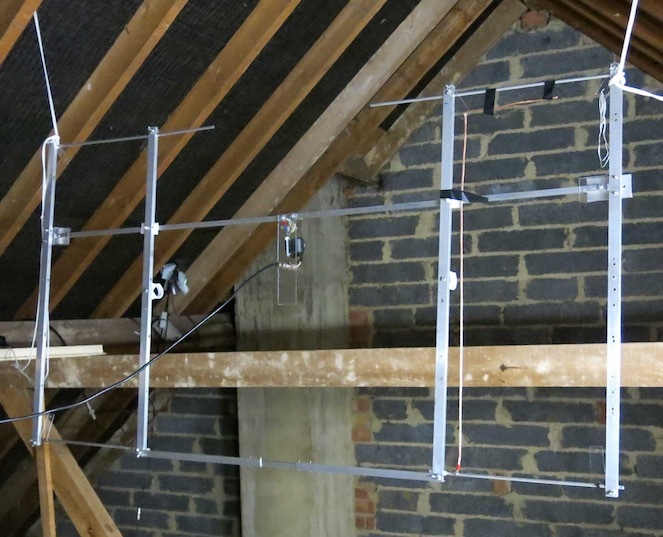 It performs well down to ka=0.4, which represents a 1.4m long antenna at 28MHz. Local signal tests are within 2dB of a reference dipole. On skywave transmissions it is difficult to tell them apart. Rotating the prototype in the horizontal plane shows a radiation pattern very similar to a dipole. The stub match technique is an obvious pairing with the next concept. 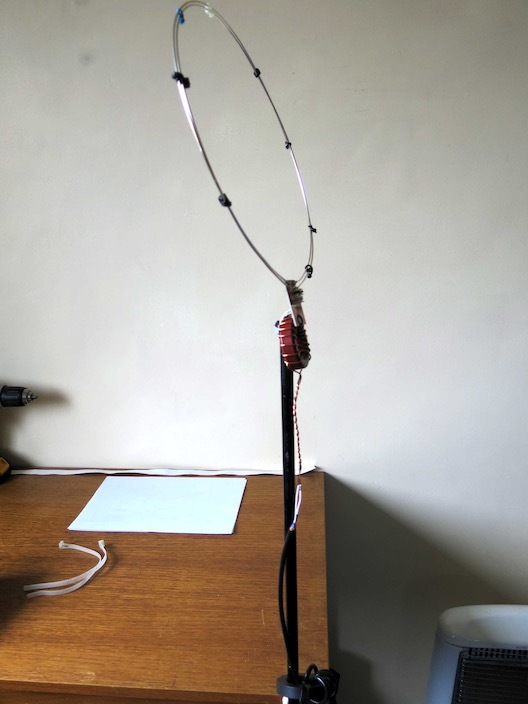 A photo of a metamaterial dipole. Non-Foster is a holy grail of antenna designers. Foster’s reactance theorem states passive components never have negative reactance. But it can be can be created using active devices. Applied to antennas, the loading inductor or passive matching circuit is eliminated. Simultaneously defeating the energy storage limitation of the Chu Limit, and allowing tuning without any awkward mechanical components. Removal of energy storage elements (passive components) results in an efficient broadband antenna. It has already been demonstrated in broadband receiving applications. Transmitting is more complicated, but there is an possible solution. It means having parts of the transceiver at the antenna. Such technology would be revolutionary in MF/HF communications, where the limitation of antenna performance at low frequency outweighs any improvements possible in receivers or transmitters. Any need for expensive mechanical variable inductors or capacitors as used in antenna tuners is also eliminated. Non-Foster matching would be a paradigm shift, BUT implementing it and even understanding intricacies of the theory are difficult. Stability is the main problem. Simulation only gets so far because objects near the antenna cause its equivalent circuit to shift, introducing a high probability of oscillation. Implementing fixed station systems would seem to be easier than handheld or mobile for this reason. The lower (HF) frequencies must be easier to implement than UHF/SHF. Equipment based on this technology may never happen if amateurs don’t do research for themselves. There are no commercially sold equipments using non-Foster matching, a wide open field for amateurs to break new ground if we can only make it work! Only some cheap parts are used, thick copper wire, a T200 iron dust toroid and two small trimmer capacitors. Performance was >10dB down on a conventional wire antenna, and bandwidth very narrow. This barely merits the word "antenna," it's almost a non-radiating narrow band dummy load. It performs even worse than the EH antenna. I found it was easy to control common mode current, by moving the coil tap to the centre, and using two turns of the coax thru a clip-over ferrite. Common mode current was always used by opponents of this design to explain its mode of operation. I have a different opinion, and also may explain why Prof. Hately vigorously defended his antenna until his death in 2012. Any tuned circuit will radiate a small amount, and give an SWR dip when viewed on a network analyser. I think Prof. Hately was deceived by a combination of “anything works“ and the vagaries of HF propagation. Antenna testing can be VERY MISLEADING.